Are you headed to Piscataway, NJ this weekend for Steampunk World’s Fair? A bunch of Steampunk Magazine contributors will be there, myself included. I’m presenting on a few panels, and I’m also going to be seeking out events that deal with the overlap between steampunk and LGBTQ culture. Here’s a few of the highlights that I’m hoping to catch; if you have any recommendations between now and Friday, send them my way! Visit Combustion Books, our publisher, at their table, and look for the Catastrophone Orchestra’s Shadow Cities presentation! For those of you who like to enter contests, there will be the Queen of Steam Drag Show, and/or the Annual Facial Hair Contest; I personally will hug anyone who enters both. For entertainment, I’m looking forward to a weekend full of burlesque shows. A few that look promising are Violet DeVille’s transgender burlesque performance, and Uncle Monty’s Mollyhouse presented by Royal Baritarian Players! Molly houses refers to 18th century English taverns for all manner of sexual deviants, and a modern version should be all sorts of fun. They’ll be at the Goblin Market and helping to host the Absinthe Tasting. If you’re looking for something more intellectual, I’m presenting in a few panels hosted by SPM contributor Steampunk Emma Goldman. Visit us on Friday at 6:00 PM for “Great Activists of the 19th Century,” and again on Sunday at 2:00 PM for a discussion on political aspects of steampunk. There’s also an excellent-looking panel on Victorian sexuality, and several on multicultural steampunk, which I’m quite looking forward to. I will be at the fair providing Manager services for Psyche Corporation as well as some Cosplay Steampunk Pirate storytelling type stuff at the Goblin Market VIP meet and greet. I am actually quite interested in intersection between Steampunk and LGBTQ, but may be somewhat preoccupied with aforesaid duties. If we manage to connect, I would be happy to provide some insights of Asexual Greys in our own Texas community who are starting to become more vocal. That might interest you a bit. We actually have some LGBT in the Texas community, but they are a bit quieter about it and so well accepted it simply hasn’t required as active a stance as you might expect down here in the bible belt. PS I write for most of the other Steampunk Magazines, and would be happy to inquire and put an article together if you like on the topic. Sorry, I only just saw this post today! But I would love to connect with you and hear about the asexual community in Texas. Could you give me your e-mail address, or shoot me a line (my e-mail is provided at my website, katie.casey.com)? Cheers! I hope you enjoyed the fair! This long-awaited issue is our thickest yet, coming in at 118 pages of mad science, history, interviews, fashion, and fiction! It can also be downloaded for free from our downloads page. Printed copies are available from Combustion Books. 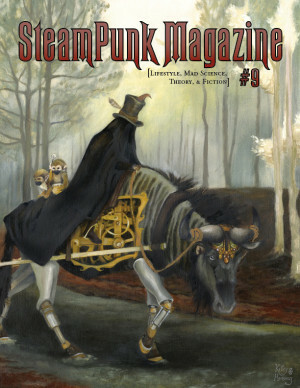 Steampunk Magazine is jointly published by Vagrants Among Ruins and Strangers in a Tangled Wilderness.